It's origins in acient Peru, the Guinea Pig or Cavy was brought to Europe in the 1500's where it soon became a popular pocket pet. It's a rodent, not a pig but the females are called sows, the males boars and the young'uns, pups. The are friendly, clean and somewhat intelligent. They do make sounds , like maybe 11 of them and if they hear you open the fridge, the "Wheek! ", which is a sound made just for humans and means "I want treats!" 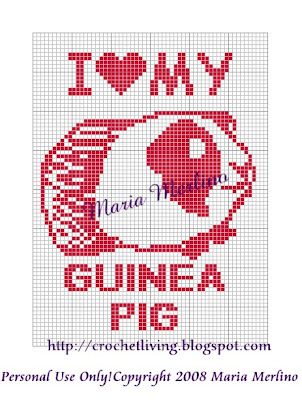 Want More Guinea Pig Items? Try Here! 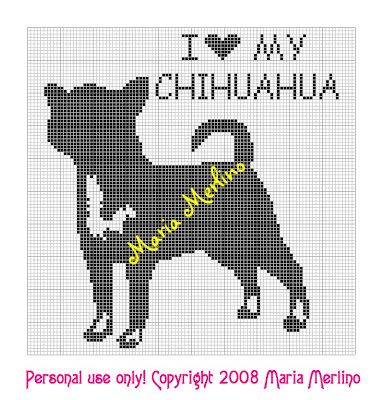 A friend over at Crochetville asked me for chart of this animal because although he loves dogs, his apartment rules don't allow the canine companion. This graph is 60 squares wide x 80 squares high and will make a rectangular piece if worked in sc with an H hook and worsted weight yarn, such as Red Heart Super Saver or Caron Pounder. Use the dc or extended double crochet for a throw sized afghan. This graph is under my copyright and I retain all my rights under federal law. You may make items for personal use only. You may not sell any items made from my graphs nor may you sell the graph itself. You may not profit in any way from my work. There is mystery surrounding the origins of the Pug. They are an ancient breed and was probably first developed in the Far East. The Pug is the original Foo dog. Happy little guys, they love to eat! Pugs can easily turn into Pigs if they are overindulged. Every Pug,or Pug mix like the Puggle (half Pug half Beagle), that I've met has totally charmed the dickens off me! I once met Altovise Davis, wife of Sammy Davis Jr. when she was staying in Philadelphia a few years ago. She has Pugs! They are not the fawn and black that we know but the rarer solid black ones. They were just darling! Check Out The Pug Collectables Right Here! 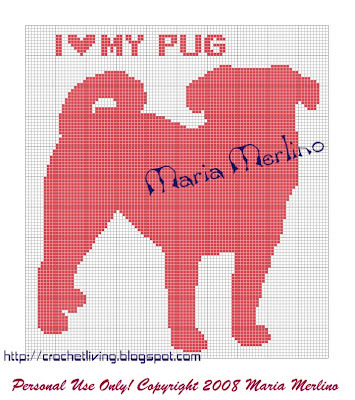 One of my friends over at Crochetville requested a Pug chart for a friend going through a bad spell. I hope this will perk up her spirits! The graph is 100 squares wide x 110 squares high. Work it in sc with an H hook and your normal worsted weight yarn, like Red Heart Super Saver or Caron Pounder. For an afghan sized piece, use a longer stitch, like the dc or the extended dc. This chart is under my copyright. It is for you personal use only and may not be sold nor may items made from it be sold. You may not profit from my work. The smallest of the Japanese native breeds of dog is the Shiba Inu. This breed was originally developed for hunting by sight and scent in the dense undergrowth of Japan's mountainous areas. He is also an excellent watchdog and companion. His frame is compact with well-developed muscles. You can visually distinguish males and females: males are masculine without coarseness, females are feminine without weakness of structure. More Shiba Inu items HERE! 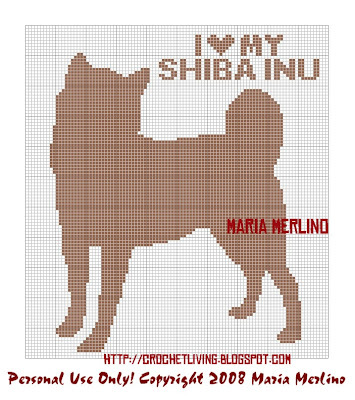 A friend from Crochetville asked if I would make her a graph of her pet Shiba. I kindly obliged. The graph is 110 squares high and 100 squares wide. Red Heart Super Saver or Caron Pounder with an H hook would give you a squarish piece. For and afghan sized unit, use dc or extended double crochet stitches. My work is my copyright. This means I retain the right to the pattern. You may make an item from this pattern for your own personal use but you may not sell the item or the pattern. You may not profit by my work. My lawyer has 2 Corgis in her office, Emmet and his son, Fitzpatrick. They like climbing up on her conference desk and are generally a very comical duo. The short little legs fascinate me! The Pembroke Welsh Corgi is a long, low dog with large erect ears, a broad flat skull and a fox-like head. The tail is almost non-existent. Although there is a variety called the Cardigan that has a long tail. The breed is hardy, highly intelligent, obedient, protective and devoted. Corgis are usually good with considerate children. They make fine guards, and excellent show and obedience dogs. Find more Corgi Dog items right here just by Clicking! 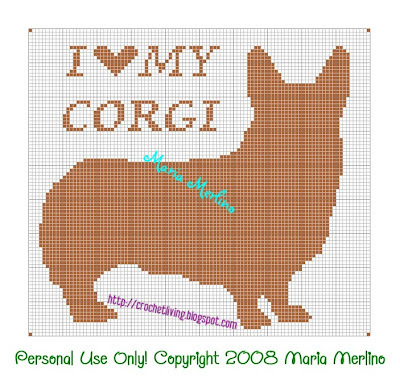 One of my friends over at Crochetville asked me to make a graph of her Corgi. This is my take on it.The graph is 100 squares wide x 90 squares high. Use Red Heart Super Saver or Caron Pounder with an H hook. If you use the single crochet stitch, you'll get a squarish piece. The double crochet or extended double crochet stitch will yield an afghan sized blanket. I sincerely hope you enjoy the chart, but please respect my copyright. I retain all my rights. The graph is for your own personal use and may never be sold nor may any item made with it be sold. You may not profit from my work. A small, friendly, independent, shaggy little dog, the Cairn Terrier has its' roots in the Scottish Highlands. This breed became very popular in 1939 when Dorothy carried him to Oz. 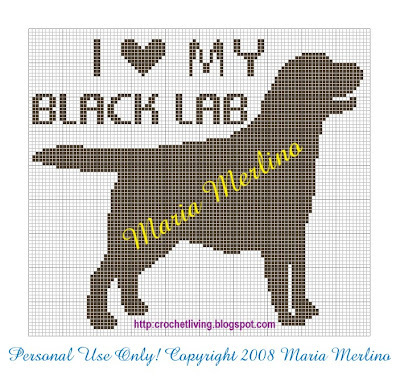 One of my friends over at Crochetville asked if I could make a graph of her dog and this is what I came up with. Hope he looks shaggy enough! The graph is 100 squares wide x 90 squares high. Use Red Heart Super Saver or Caron Pounder with an H hook. If you use the single crochet stitch, you'll get a squarish piece. The double crochet or extended double crochet stitch will yield an afghan sized blanket. 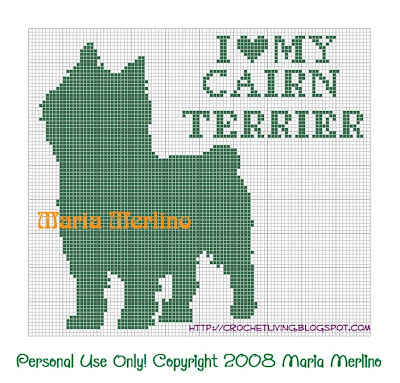 If you like the Cairn Terrier, here are more things you'll like! I retain all copyrights to my patterns. This pattern is for you personal use only. Neither the pattern nor any items made from it may be sold. You may not profit from my work. For my next graph, I present to you the strikingly beautiful, Siberian Husky. With it's striking masks or spectacles, and other facial markings, they tend to have a wolf-like appearance. The eyes are blue, brown or "bi-eyed" with one blue iris and the brown. The tail is shaped like a sickle. Though the breed is not related to the wolf any more closely than any other breed of dog, it is thought they maintained this appearance through isolated breeding in Siberia. They make good pets,though they are high energy and need plenty of exercise. They are not used as guard dogs because of their gentle spirit. 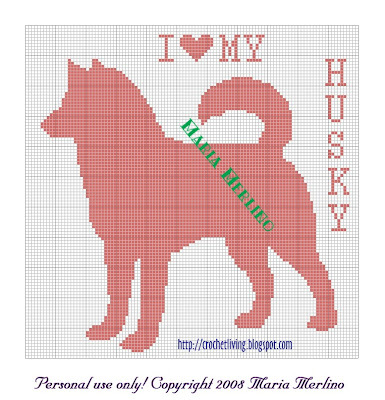 I got this request from one of my friends at Crochetville and was really happy to design it because the Husky is a dog I gravitate to when ever I see one in the park. The chart size is 110 squares x 110 squares. Use an H hook with your favorite worsted weight yarn. Single crochet it for a square piece or use double crochet or even better, extended double crochet stitches for an adghan sized piece.For all things Siberian Husky--->>>CLICK HERE! My patterns, charts and graphs belong under my copyright. They are for personal use only. The actual pattern and made items may never be sold, or used for profit. If you see any illegal use, please contact me . In appreciation, I will have a reward for you. Crochet Ripple Sweater For You and Matching Ripple Sweater For Your Little Dog! I thought it would be fun to give you this vintage pattern for a ripple sweater and a matching dog sweater. I think they are adorable! You'll be like 2 Peas in a Pod! The colors in the original pattern are typically early 60's but I know that you can change the color scheme to suit your needs. More Ripple Patterns Right Here! Size: Fits a small to a medium, but using a larger hook will give you a bigger size. Row 1: With K hook, starting at neck edge with Opal Blue ch 160, switch to J hook, s c in 2nd st from hook, s c in next st, 3 s c in next st, s c in each of the next 2 sts, * skip 2 sts, sc in each of the next 2 sts, 3 s c in next st, s c in each of the next 2 sts, repeat from * across ch ending to correspond, ch 1, turn. 2nd ROW: Work­ing in back loop of sts throughout dec 1 st (to dec: insert hook in st, pull yarn through, insert hook in next st, pull yarn through, Y 0 and work off all loops at one time), s c in next s c, * 3 s c in next s c, s c in each of the next 2 s c, skip next 2 s c, s c in each of the next 2 s c, repeat from * across row ending to correspond dec 1 st at end of row, drop Opal Blue ((when changing color always complete last half of st with next color), attach Sand, ch 1, turn. 3 s c in point and 2 s c in next s c after point). NEXT 6 ROWS: Work even. NEXT ROW: Start separation for Body Sections and Sleeves: Work in pattern inc over first 4 points (front), ch 15, skip next 4 points (sleeve), work inc across next 7 points (back), ch 15, skip next 4 points (sleeve), work inc over last 4 points (front). NEXT ROW: Work even across all sts and chs (17 points). Continue even in pattern and color scheme for 30 inches or length desired from underarm. Fasten off. SLEEVES: Working on opposite side of un­derarm ch, attach yarn and work in pattern across ch and free points (5 points). NEXT 4 ROWS: Work even in pattern and color scheme. NEXT ROW: With same color as last row work in pattern, cut yarn. Sew sleeve seams, with matching colors. FRONT BORDER: With Antique Gold start­ing at lower edge of right front work 2 s c over each stripe to top of 1st point at neck edge, 2 s c in point, then 2 s c in each re­maining point, work down other edge to correspond to opposite edge, cut yarn, do not turn. NEXT 2 ROWS: Working in back loop of sts work s c in each s c in each row, cut yarn. Work in pattern across lower edge of coat, fasten off. Directions are given for a 14 inch length. 19 inch length is given in parentheses. Row 1-2: With Opal Blue ch 48 (69). Work first 2 rows same as Coat on this page but join all rows and ch 1 to turn each row. NEXT 6 (8) ROWS: Repeat the 2nd row of coat follow­ing same color scheme. 9th (11th) ROW: Same as inc row of coat. NEXT 4 (6) ROWS: Work even. 14th (18th) ROW: START LEG OPENINGS: With Opal Blue (Antique Gold) work across 1st 1 (2) points. There are 9 (18) sts, ch 1, turn. NEXT 1 (3) ROWS: Work even dec 1 st beg and end of row, cut yarn (side section), turn. Skip next 11 s c of last long row for leg opening, attach Opal Blue (Antique Gold) in next s c, s c in same space, s c in each of the next 2 s c, * 3 s c in next s c, s c in each of the next 3 s c, skip next 2 s c, s c in each of the next 3 s c, repeat from * once (twice), 3 s c in next s c, s c in each of the next 3 s c, ch 1, turn. NEXT 1 (3) ROWS: Work in pattern across these sts dec 1 st at beg and end of each row (back section), cut yarn, turn. Skip next 11 sts of last long row, attach yarn in next s c, work side to correspond to 1st side, cut yarn, turn. 16th (22nd) ROW: Attach Sand (Sand) in 1st s c, working across all sections dec in 1st 2 sts of 1st section, then work across 1st section ending with s c in each of the last 4 s c, ch 7, s c in 1st s c of back section, s c in each of the next 3 s c, continue in pattern across back section ending with s c in each of the last 4 sts, ch 7, s c in 1st st of other side section, s c in each of the next 3 s c, 3 s c in next s c, continue in pattern across section dec in last 2 sts, ch 1, join, turn. NEXT 10 (14) ROWS: Working over ch in 1st row work in pa'tern following color scheme and joining each round. 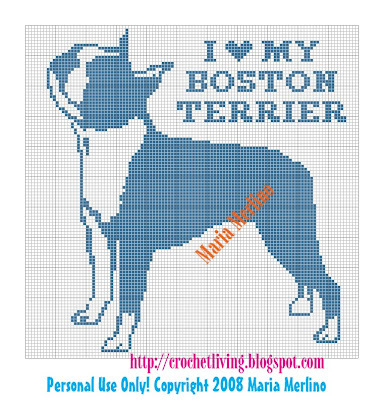 27th (37th) ROW: Work even in pattern but do not join, ch 1, turn. NEXT 5 ROWS: Repeat last row. 33rd (43rd) ROW: Dec in 1st 2 sts, dec in next 2 sts, work in pattern across row end­ing to correspond, ch 1, turn. 34th (44th) ROW: Dec in 1st 2 sts, dec in next 2 sts, 1 s c in each of the next 3 s c, skip next 2 s c, 1 s c in each of the next 3 s c, 3 s c in next s c, continue across row in pattern ending to correspond, ch 1, turn. 2 s c, skip next 2 s c, s c in each of the next 3 s c, continue across row in pattern ending to correspond, ch 1, turn. 36th (46th) ROW: Dec in 1st 2 sts, skip next 2 s c, s c in each of the next 3 s c, continue across row in pattern ending to correspond, ch 1, turn. 37th (47th) ROW: Dec in first 2 sts, dec in next 2 sts, s c in next s c, 3 s c in next s c, continue in pattern across row ending to correspond, cut yarn. With wrong side of work toward you attach Opal Blue (Antique Gold) at separation, sl st in each row, work in pattern across the s c, sl st in each row on opposite side, join, cut yarn. LEG SECTION FOR SMALL SIZE: Work as follows: with right side of work and center seam toward you and neck edge to top, attach Opal Blue in first Sand row of leg opening to right of seam, 2 s c in same space, 2 s c in next Opal Blue row, skip next 2 s c, 1 s c in each of the next 3 s c, 3 s c in center st of point, s c in each of the next 3 s c, skip next 2 s c, 3 s c over side of Blue row, 3 s c in Sand row (inc point), s c in next Sand row, 1 s c at base of next 2 sts, skip next 2 sts, 1 s c in each of the next 2 sts, 2 s c in next st, join, ch 1 to turn each row. NEXT ROW: With Sand 2 s c in 1st s c, s c in each of the next 2 s c, * skip next 2 s c, s c in each of the next 3 s c, 3 s c in next s c, s c in each of the next 3 s c, repeat from * once, skip next 2 s c, s c in each of the next 2 s c. 2 s c in next s c, ch 1, turn. Repeat last row once. NEXT ROW: s c in each of the first 3 s c, * skip next 2 s c, s c in next s c, dec in next 2 s c, 3 s c in next s c, dec in next 2 s c, s c in next s c, repeat from * once, skip next 2 s c, s c in each of the next 3 sts. NEXT ROW: S c in each of the next 2 s c, * skip next 2 s c, s c in each of the next 2 sts, 3 s c in next s c, 1 s c in each of the next 2 sts, repeat from * once, skip next 2 s c, 1 s c in each of the next 2 sts. NEXT ROW: 2 s c in 1st s c, * skip next 2 s c, 1 s c in each of the next 2 s c, 3 s c in next s c, s c in each of the next 2 s c, repeat from * once, skip next 2 s c, 2 s c in next s c.
NEXT ROW: Sl st loosely in each st, join, cut yarn. Work other leg but start at end of first row and work to beg of row. Work remainder of leg in same manner. 3 s c in next st, s c in base of next 3 sts, join in first s c.
NEXT 7 ROWS: Work in pattern. NEXT ROW: Sl st in each st, join, cut yarn. Work other leg in same manner but start at the end of 1st row and work to beg of row. Work remainder of leg in same man­ner. s c, 2 s c in next st, 3 s c over next ch 2, repeat from * all around omitting the 3 s c group in last repeat, join, ch 1, turn. NEXT ROW: Sc in each of the next 3 s c, * skip next ch 2, s c in each of the next 4 s c, 3 s c in next s c, s c in each of the next 4 s c, repeat from * across row ending to correspond, join, cut yarn. POMPONS: Make 1 of each color. Wind yarn 50 times over a 3/4 inch cardboard. Tie one end, cut other end. Trim into shape. Tie tog and fasten to sweater as illustrated. CORD: Take two 1 and 1/2 yd. lengths of Opal Blue. Twist tightly, fold in half and let twist itself. Tie ends. Lace through holes of Sand row at neck edge. In my personal library, I have a booklet called Ripples, Knitted and Crocheted. The size of the booklet is 5 1/4 inch by 7 5/8 inch. In the upper left hand corner is American Thread Company.Below that is Star Book No. 183. In the upper right hand corner is 29 (cents). There is no copyright date. However I have reformatted, and cleaned up the type and made adjustments to the original pattern. I have cleaned up the photos and drew on them. The subject of many of William Wegman's photos, the Weimaraner is a German hunting dog. Wegman has used his own pet Weimaraner in costume in all kinds of strange and different situations. These photos have gone on to be quite popular as prints and on greeting cards and have become a major factor in the publicizing of a formerly little known breed of dog. 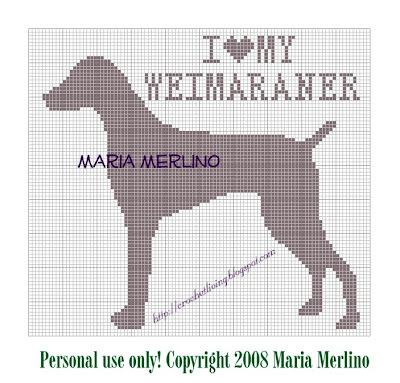 There are lots of Weimaraner items here:Weimaraner Stuff! 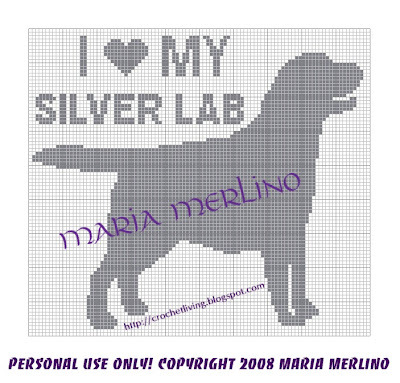 My friends over at Crochetville asked for a Weimaraner to crochet and this is what came off my drawing board. The chart is 100 squares across x 90 squares high. Crochet it in worsted weight yarn with an H hook in the sc stitch. If you want an afghan sized piece, use the dc or extended double crochet. Hey! maybe you can do it in Tunisian stitch! This pattern belongs to me and is under my copyright. You may make items for your own personal use but not for profit. Please don't violate my copyright. I enjoy creating the patterns for you to use for yourself. The Yorkshire Terrier is a most popular breed! In my neighborhood, Yorkies live in the lap of luxury! My good friend, Lynnie, is on her third one. The each of the first two died of natural cause at ripe old ages. The second one, Rocco, had bad teeth and had to have them removed when he was 11 years old but he thrived on soft food and loved to go shopping in a big Louis Vuitton bag. 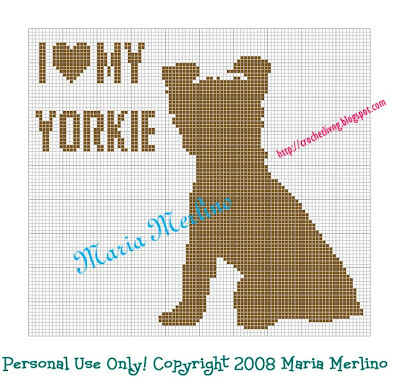 One of my friends over at Crochetville requested a Yorkie graph and here it is! The size is 100 squares across x 90 squares high. Use your favorite yarn, like Red heart Super Saver or Caron Pounder and an H hook with sc, or you could do an afghan sized blanket using the dc or extended double crochet. Darling Yorkie Items For You! I hope you enjoy this graph. Please respect my copyright and do not distribute my work anywhere at all. You may not make items to sell from my graphs or profit in any form. All my graphs are for your own personal use. If you see my graph being used illegally, and you are the first to contact me, I will reward you. Here are four color varieties of the Labrador Retriever. My dog Cheech was in love with a black lab. He was a big galoot and they fetched sticks and tennis balls for hours. 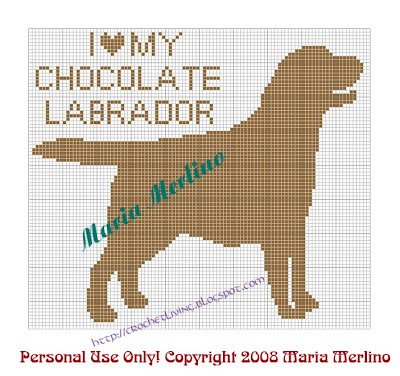 I wanted to do a graph for him and I got carried away with the colors when one of my friends over at Crochetville told me she had a Chocolate Lab. I did some research and discovered that there are two additional colors, Yellow and the rare Silver. 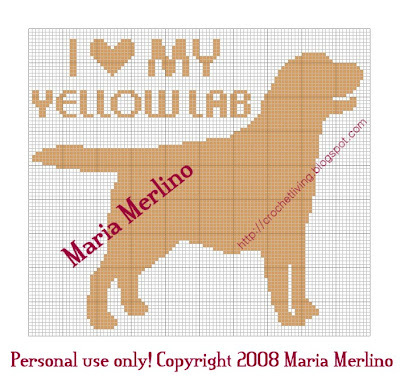 Get Your Lab Doggy Stuff Here! I hope you enjoy these graphs. Remember that they are copyrighted and are not for selling or posting anywhere on the internet. You may not profit in any way from my graphs. My niece has rescued 2 beautiful Greyhounds! These dogs are so soft and warm. They love being couch potatoes! But, she can never take them off the leash when walking because they will RUN!!!!! I have designed a graph pattern for the Greyhound. Coincidently, my friends at Crochetville also requested a graph. The size of this chart is 100 squares high x 100 squares wide. Work the design in sc with an H hook and worsted weight yarn, like Red Heart Super Saver or Caron Pounder. I sincerely hope you enjoy this pattern but please don't violate my copyright. 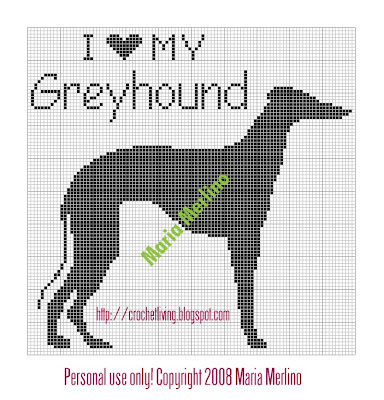 Do not sell or or profit by my work.Check Out All The Greyhound Products! 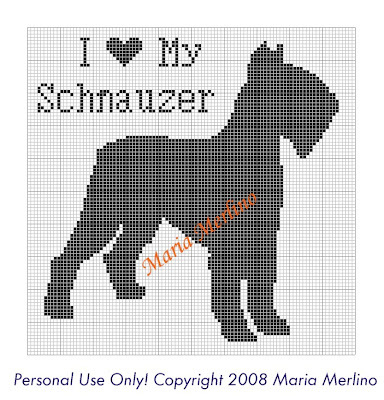 I got a request from one of my friends over at Crochetville for a Schnauzer graph. I was very happy to make this for her as I am very fond of all dogs. I hope you enjoy this graph! It is 100 squares high x 100 squares wide. You can use worsted weight yarn like Red Heart Super Saver or Caron Pounder in the sc stitch. For a afghan sized piece, use dc or extended double crochet. I'm sure you can work this up in a filet technique also. 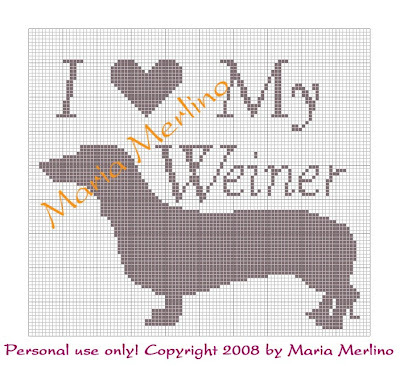 I was inspired to create my own version of the I "Heart" My Weiner graph that was posted over in Crochetville. I thought it was so amusing that I wanted to get in on the act. This graph is 100 squares across and 90 squares high. Dachshund Related Prducts Are Right Here! Use single crochet and an H hook with a worsted weight yarn like Red Heart Super Saver or Caron Pounder. Here is the cat graph that I have designed for the members of Crochetville. This is just the basic graph and I will be adding to it soon! Click on the graph for the full page version. Crochet a Cat or Kitty! Look Here!